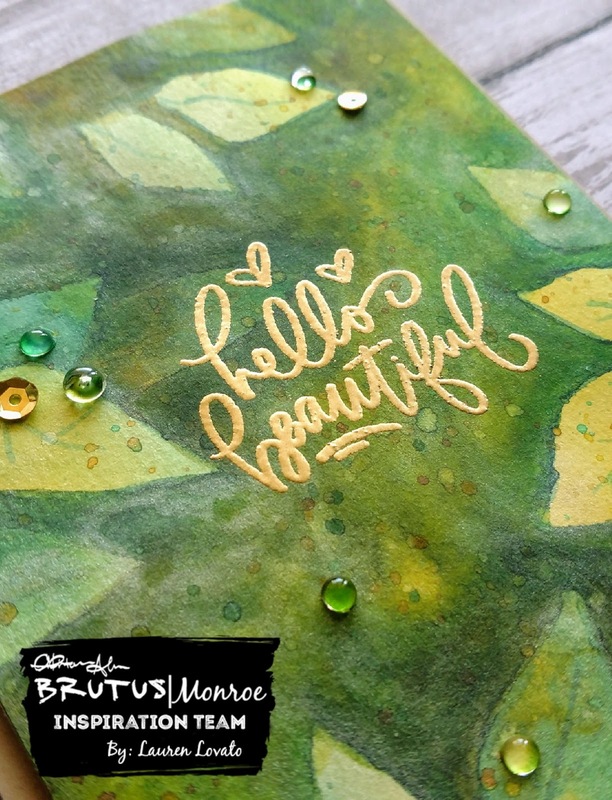 It's Wednesday, which means blog hop day for the Brutus Monroe inspiration team! This week is an "Anything Goes" week, and we have some guest designers hopping with us as well, so be sure to check out the rest of the blogs! 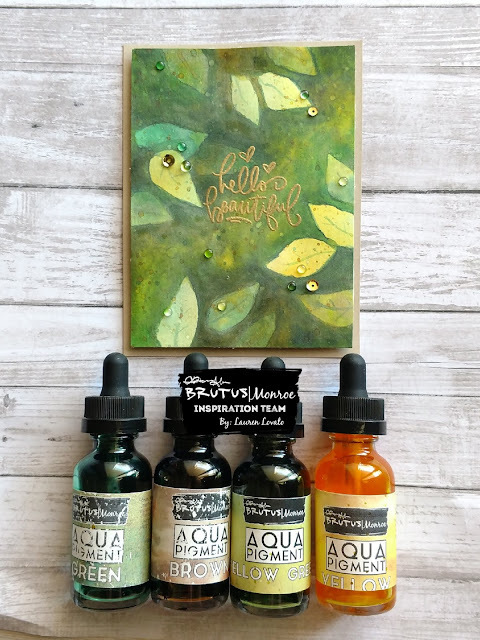 I decided to work with aqua pigments this week, as I really love them and I've been neglecting them lately! I've watched some YouTube videos of a technique called "negative space painting" and wanted to give it a try. It turned out very different than I expected, but the result was still kind of fun and I thought I would still share it. The idea of the negative space painting is that, instead of painting the actual items (in this case leaves) you paint around the shape, darkening the background and layering more leaves as you go. I started out by putting the colors Yellow, Green, and Yellow-Green into my palette. Then I mixed Yellow with a little bit of Brown in another compartment, and I mixed Green with Black in another for the darkest shade. Finally, I mixed Yellow with some of the metallic Sunflower, just to add a little shimmer and shine. To begin the technique, I first did a soft color wash with Green, Yellow and Yellow-Green. I dried it with the heat tool and then began with Green to paint the outline of some leaf shapes. I filled in the areas around the leaf shapes, leaving them the color of the light wash. These are the brightest leaves that you see on the piece. I dried that layer with a heat tool and moved on to the next layer. I repeated the process, adding a couple more leaf shapes and filling in the space around them with various shades of greens and yellows and browns. The next brightest leaves are the second layer. This process continues for as many layers as you want, and it makes each layer of leaves slightly darker than the next, giving it some depth. It's meant to look like the brightest leaves are in the foreground, and the darkest are in the background. After 4 layers of leaves, I dried the whole piece thoroughly with the heat tool. I took a very fine tip paintbrush and painted a few veins into the leaves, and splattered some of the different green, brown and yellow tones across the whole panel. I heat embossed the sentiment with Gilded EP and used foam tape to pop the whole panel up onto a piece of Lunch Bag cardstock. I finished it off with a few gold sequins and some clear acrylic bubbles. 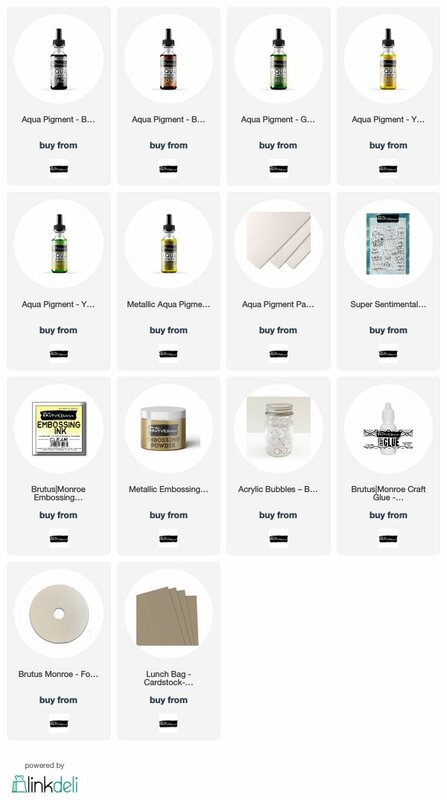 Have you tried any freehand painting or cool techniques with the aqua pigments? Share your creations on social media, and be sure to use the hashtags #BrutusMonroe and #CreateYourOwnEnding so we can see what you make! Next on the hop list is one of our awesome guest designers, Kelly! She is super talented, and I had the pleasure of meeting her in person in the Heffy Doodle booth at Creativation this year. Check out her awesome project! Beautiful work, Lauren! I have yet to try negative space painting. Thanks for the inspiration!